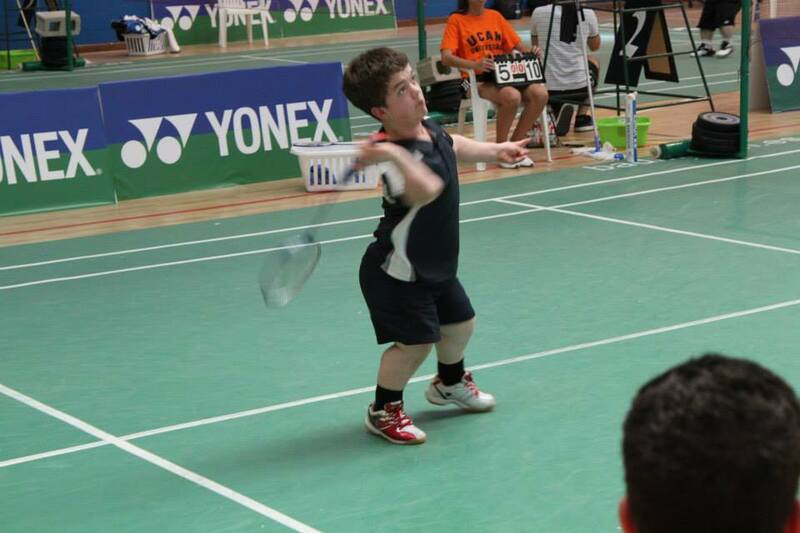 In Parabadminton there is a dwarf class which is called SS6 and players from all over Europe made their way to Murcia to compete in the bi-annual European Championships. Issac Dalglish, Andrew Martin, Jack Shephard and Krysten Coombs represented Team England. Bobby Laing represented Team Scotland and Niall McVeigh represented Team Ireland. Alongside these players were competitors from Poland and Russia. The weather was particular hot for the time of year and the sports hall was in the mid 30's all week, this made the shuttles fly particularly fast and made the games fast and exciting but also challenged the players to adjust their game to suit the climate, a good level of fitness was a must as was regular water and the right food to avoid heat exhaustion. All the players had two to three games for each day to try and keep extended play in the heat to a minimum. The first few games were all singles games and as you might expect they were all exciting games, all the English players had to play each other first with Andrew and Jack winning their games against Krysten and Isaac. After those games had been played the players mixed playing different countries with Bobby Laing playing particularly well against Andrew and the Russia player, Bobby is benefitting from regular training with the Scottish team and is improving at every event. Jack and Niall had a brilliant game which ended in Niall winning in two games to get into the semi finals but really showed how much closer to the top seeds the young players are getting. By the end of Thursday the semi finalists were known. On Friday Jack would play Andrew and Niall would play Krysten in the semi finals. On Saturday morning two very exciting semi finals were played with Andrew Martin and Niall McVeigh winning to set up a repeat of the final from the World Championships from November 2013. So it was that Andrew and Niall met on Sunday in the singles final and what a final it was, the first set was so close that there was never more than 2 points between the players and it had to go to extended play. Andrew won that first set and set his sights on game number two, as always Niall played fantastic badminton he is a total professional and very rarely lets an opponent get ahead by more than a point or two, in the second game Andrew played out of his skin and managed to ease ahead by 5 points and although that fluctuated from time to time he managed to hold on to his lead to win the second game 21-17 to become European Champion for 2014. A very exciting final which held the whole audience spellbound. The doubles event was just as exciting. With Ollie Clarke still recovering from surgery Andrew played with Isaac Dalglish and this opened up the whole event as the pairings were so very close. The doubles was played as a group so every pair played each other to decide the winner. During the games there were so many great matches. With two unexpected upsets going against what would normally be expected, Isaac and Andrew managed to beat Jack and Krysten in two games that were so close it could have gone either way so many times, they had the whole hall watching every point and their victory left the whole competition wide open. For the doubles Bobby Laing played with the Polish player Grzegorz Jednaki, he and Bobby played together in Loughborough and are starting to read each other's game so are fast becoming an established pair they worked hard to get the best score lines they have had since getting together earlier in the year. Jack and Krysten regrouped ready for their games against Niall and the Russian player Alexi. Up to that point Niall and Alexi had been unbeaten and on paper were the strongest pairing. Jack and Krysten played at their very best with the first game being nip and tuck and going to 23-21, in the heat of the hall both pairings fitness was being tested to the full. In the second game Niall and Alexi made an early run of points winning it quite easily keeping their lead all through the game, leaving it all to the third game and in an amazing final game Jack and krysten never gave up on a point to hold a lead of 18-10 at one point but Niall and his partner did not give in and managed to win seven more points before Jack and krysten managed to secure the match win at 21-17. So at the end of the group three pairs had won two and lost one match so the winners had to be decided on numbers of sets won and lost leaving Niall and Alexi as European Champions, Andrew and Isaac second with Krysten and Jack third a really exciting and closely run event. Team England had more success in the other classes winning medals in the wheelchair and standing classes which left team England top of the medals table with 17 medals in total. Ireland won medals in the Wheelchair and dwarf class and Scotland had medal success also. Overall the UK home countries had an extremely successful week with DSA members bringing 9 medals home. Coming soon are more 4 nations events in Ireland and Scotland, plus one day circuit events and the DSA Boccia and Badminton weekend. If you would like to have a go at Badminton the DSA regions regularly have Badminton sessions and there are inclusive clubs all over England, perhaps you are the next European or World Champion.